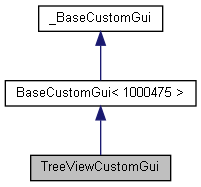 The tree view custom GUI (CUSTOMGUI_TREEVIEW) is a very versatile list view interface. [in] root The root object. The caller owns the pointed object. [in] functions The tree view functions. The caller owns the pointed object. [in] userdata The user data. The caller owns the pointed object. Sets the layout of the tree view. [in] columns The number of columns. Sets the header text for a column. [in] lColumnID The column index. [in] str The header text. Gets the tree view user area. The tree view user area. The tree view owns the pointed user area. Gets the header user area. The header user area. The tree view owns the pointed user area. Gets the auto-width of the column. [in] lColID The column index. Gets the size of the column the user has set. Gets the real column width. Sets the user column width. [in] lWidth The column width to set. Scrolls to pObj and expands the tree if necessary. [in] pObj The object to scroll to. Expands the tree to pObj. [in] pObj The object to show. Gets the cell position of pObj. [in] pObj The object to get the cell position for. [out] pArea Assigned the user area pointer. [out] x Assigned the left X coordinate. [out] y Assigned the left Y coordinate. [out] w Assigned the width. [out] h Assigned the height. [out] lTextOffset Assigned the text offset. Queries the internal scroll group for its currently visible region, a rectangle between (x1,y1) and (x2,y2). [out] x1 Assigned the X coordinate of the top left visible corner. [out] y1 Assigned the Y coordinate of the top left visible corner. [out] x2 Assigned the X coordinate of the bottom right visible corner. [out] y2 Assigned the Y coordinate of the bottom right visible corner. true if the visible area could be retrieved, otherwise false. Gets the number of currently visible lines related to folded and unfolded items of the tree. The number of visible lines. Checks if pObj is the focus item. [in] pObj The object to check. true if pObj is the focus item, otherwise false. [in] pItem The new focus item. Retrieves the layout container of the tree view. The container of the tree view layout. Basically the same container passed in SetLayout() but reflecting any change of the column order. Gets the object for a line in the tree view. [in] line The line in the tree view. [out] level Assigned the hierarchy level of the tree. The object, or nullptr if there is no object. [in] pItem The new selected item. Sets the internal scroll group currently visible region, a rectangle between (x1,y1) and (x2,y2). [in] x1 The left x value. [in] y1 The top y value. [in] x2 The right x value. [in] y2 The bottom y value.